Three Inspiring Laundry Rooms - Oak House Design Co. I was up doing laundry late Sunday night, and I couldn't help but start to think about how the space could be updated. Below are three of my favorite laundry room updates that inspire me to want to update my own space! First up is this epically awesome makeover by Sharon Joyce Interiors. 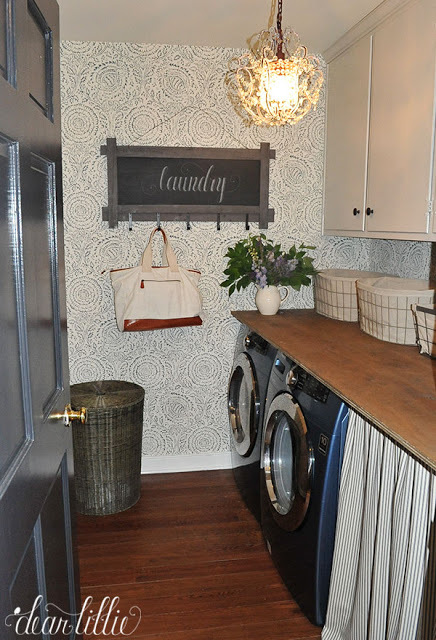 She made over her laundry room for the One Room Challenge last spring. The stenciled walls and mirror are everything! I also love how light and bright the space is even though it doesn't have any windows. Next up is an inspiring makeover by the talented Julie Blanner. I love that she elevated the look of ho-hum original cabinetry with the use of gold toned hardware. And do you see what she did to a basic utility sink? The skirt and gold faucet are to die for! And finally the wonderful makeover by Jennifer over at Dear Lillie. She also took dated cabinetry and updated them with paint and hardware. I also love that she has folding space over her washer and dryer. This room's layout is the most similar to mine. 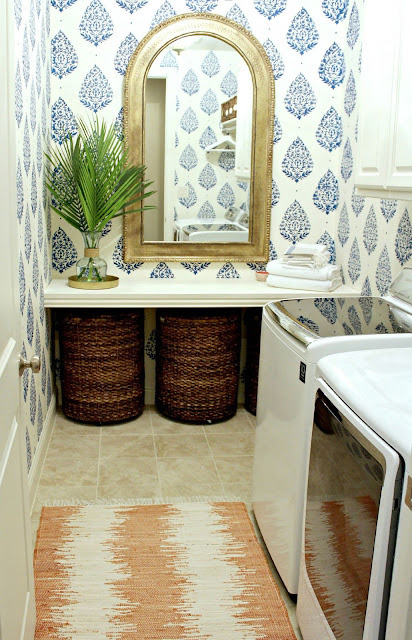 Blue and white seem to be a common theme and something that I want to incorporate into my own laundry room makeover. It's also great for a space that's all about water! I will be back to share a design board on Wednesday. The walls in my laundry roon are begging for paint, although I may have accidentally started stripping wallpaper in the bathroom. Somebody help me! 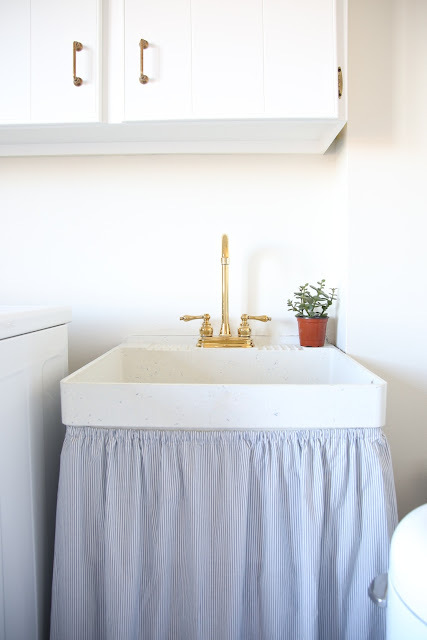 For more inspiring laundry room photos, check out my Laundry Room board on Pinterest.